Tropilaelaps mites are native to Asia and naturally parasitise the brood of the Giant honey bees of Asia, such as Apis dorsata. Two species of Tropilaelaps mites (Tropilaelaps clareae and T. mercedesae) are also able to parasitise European honey bees (Apis mellifera). Tropilaelaps mites are external parasitic mites that feed on the haemolymph (blood) of drone and worker bee pupae, as well as reproduce on honey bee brood. Tropilaelaps mite infestation causes severe damage to honey bee colonies such as deformed pupae and adults (stunting, damaged wings/legs/abdomens), parasitic mite syndrome (PMS) and colony decline. The colony may also swarm or abscond, further spreading the mite to new locations. 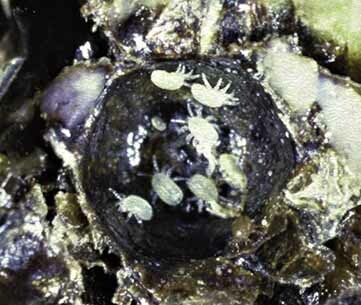 Tropilaelaps mites can also spread viruses which further affect the colony’s health and disease susceptibility. If Tropilaelaps mites were to become established in Australia, they would cause significant losses to managed and wild honey bee colonies, crop pollination and yields of honey products. 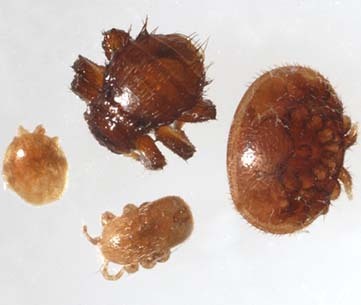 The life cycle of Tropilaelaps mites is very similar to that of Varroa mites in many ways, as both species of mites are external feeders which parasitise the brood stages of the honey bee. However, Tropilaelaps mites have a much shorter life cycle, and because of this, have a much greater reproductive rate than Varroa mites. Because of this greater reproductive rate, research has shown that in some hives there can be around 25 Tropilaelaps mites to every Varroa mite in a honey bee colony. 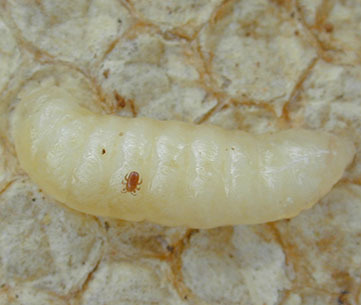 However, unlike Varroa mites which can survive on adult bees for quite a few months, Tropilaelaps mites can only live for around 3 days on an adult worker bee as the adult Tropilaelaps mite mouthpiece cannot pierce the adult wall membrane, and therefore, cannot feed on adult worker bees. For this reason, Tropilaelaps mites spend the majority of their life in the brood and will continue to breed and survive in a honey bee colony as long as there is brood present. 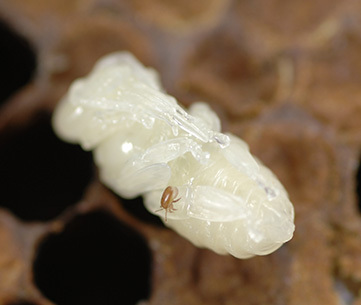 A female Tropilaelaps mite will enter worker and drone brood cells that are in the process of being capped and lay 1–4 eggs (though typically 3 or 4). 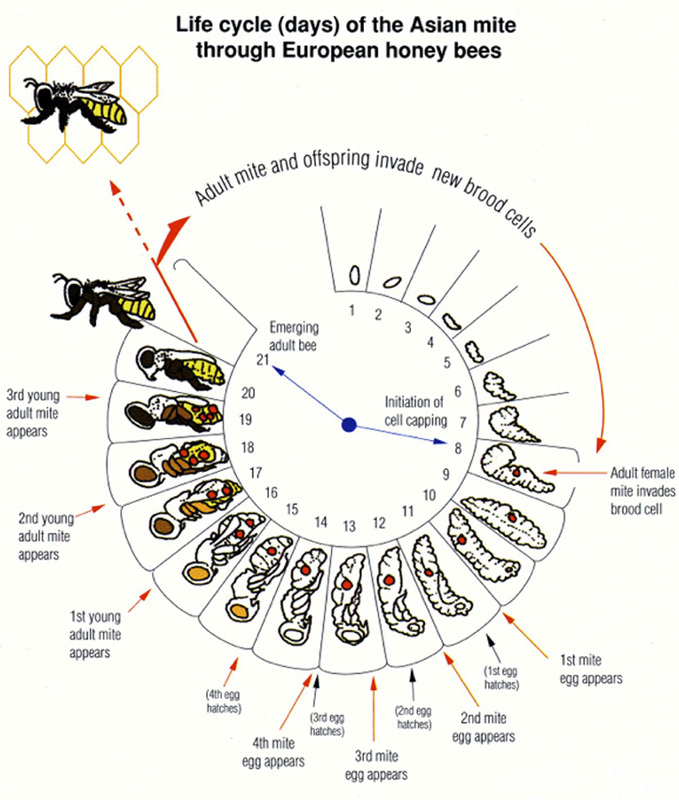 The development from egg to adult takes approximately one week and the adult mites (usually about 2–3) will emerge from the brood cell along with the emerging young adult bee. 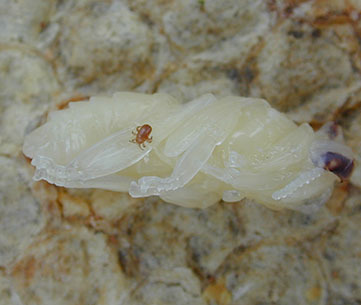 While in the capped cell the larval/nymph stage of the mite is white in colour and feeds on the developing brood. 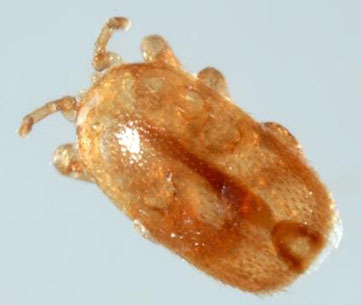 Adult Tropilaelaps mites are active, red-brown mites around 1mm in length and typically 0.5mm wide, about one third the size of a Varroa mite. Considering that Tropilaelaps mites cannot survive for very long on adult bees, the vast majority of adult mites (>95 per cent) will typically mate and re-enter a brood cell to lay more eggs within 2 days of the adult bee emerging from the capped brood cell. 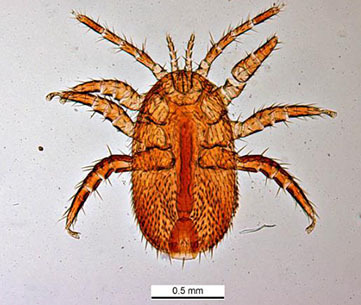 Tropilaelaps mites are active, red-brown mites around 1mm in length (though T. mercedesae is slightly longer) and typically 0.5mm wide, about one third the size of a Varroa mite. Tropilaelaps mites can be seen with the naked eye on both adult honey bees or in the brood. They have four pairs of legs, the first pair of legs are held upright resembling antennae and the body appears unsegmented. Tropilaelaps mites are a fast-running mite, moving rapidly across the brood combs which can be easily observed during comb inspection. 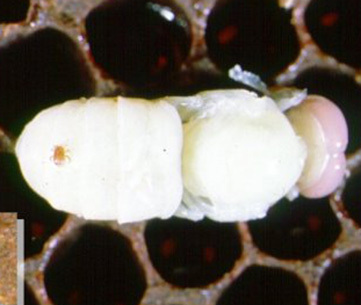 The young larval/nymph found within the brood cells are white in colour and are typically motionless while they feed on the honey bee brood. 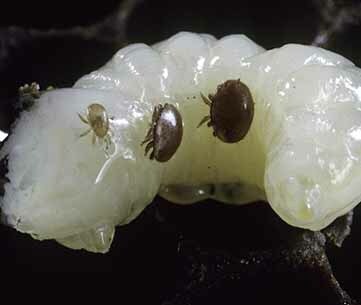 Adult Tropilaelaps mites lay eggs in the brood cells of honey bee larvae and feed on developing honey bees. The symptoms of Tropilaelaps infestation are very similar to that of Varroa mites, and are generally termed as parasitic mite syndrome (PMS). 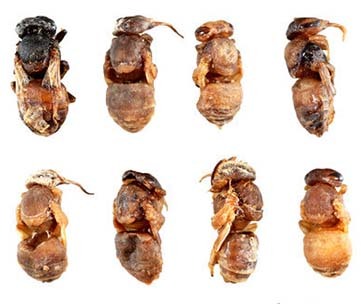 Infestation results in the transmission of honey bee viruses, such as deformed wing virus, and causes the death of many pupae, resulting in an irregular brood, deformed honey bees with missing legs or wings and a reduced weight and life span of adult bees. 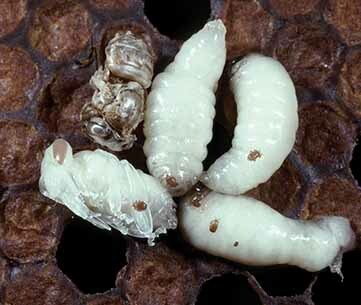 Irregular and poor brood patterns are also common, as nurse bees try to clean out the sick or infected pupae. Crawling honey bees and brood discarded at the entrance of a colony may indicate a colony heavily infested with Tropilaelaps mites. Heavy infestation of Tropilaelaps mites will invariably lead to the colony absconding, or colony collapse. Observing Tropilaelaps mites on adult honey bees is difficult because only 3–4 per cent of adult Tropilaelaps mites attach themselves to adult honey bees. When adult Tropilaelaps mites emerge from a brood cell, they almost immediately enter another brood cell within 48 hours, which makes it unlikely that they will be noticed on adult bees until the level of infestation is quite high. Considering this low percentage of the population on adult bees, some detection methods which are used for Varroa mites, such as alcohol washing and sugar shaking are not believed to be effective at detecting Tropilaelaps mites. Since Tropilaelaps mites cause very similar symptoms to Varroa mites, beekeepers should always look out for symptoms of PMS in their colonies of honey bees. Symptoms of PMS include irregular brood patterns, dead brood remaining partially uncapped in cells, malformed bees with distorted abdomens, stubby wings, or deformed or missing legs, as well as perforated cappings as a result of hygienic behaviour of worker bees. Nurse bees may also start depositing deformed crawling bees and brood at the entrance to the hive when a colony is heavily infested. General colony symptoms such as a reduction in the bee population and generally colony health may also be noticed. Tropilaelaps mites are highly mobile and can easily spread between honey bees and within a colony. Short and long distance spread can occur through beekeeper management practices, such as the transportation of infested hives or equipment (such as beekeepers clothing), or through the movement of combs between hives. Natural behaviour of honey bees, such as swarming, drifting, robbing or absconding can also easily spread Tropilaelaps mites. Unlike Varroa mites, which can potentially survive on adult honey bees for months, Tropilaelaps mites can only survive on adult honey bees for around three days. Therefore, the level of Tropilaelaps mite spread is somewhat dependent on the level of brood within colonies. Tropilaelaps clareae is currently only present throughout Asia, while Tropilaelaps mercedesae is present throughout regions of mainland Asia and Indonesia. Both species are now also present in Papua New Guinea. 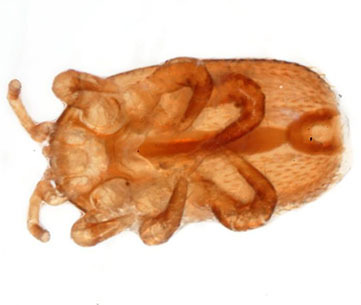 Tropilaelaps mites could be confused with other exotic parasitic mites, most notably Varroa mites (Varroa destructor and V. jacobsoni), though the body of the Varroa mite is wider than Tropilaelaps and moves more slowly. Since Tropilaelaps mites cause very similar symptoms to Varroa mites, beekeepers should always look out for symptoms of PMS in their colonies of honey bees. Symptoms of PMS include irregular brood patterns, dead brood remaining partially uncapped in cells, malformed bees with distorted abdomens, stubby wings, or deformed or missing legs, as well as perforated cappings as a result of hygienic behaviour of worker bees. Nurse bees may also start depositing deformed crawling bees and brood at the entrance to the hive when a colony is heavily infested. General colony symptoms such as a reduction in the bee population and generally colony health may also be noticed. These symptoms could also be associated with a variety of other honey bee pests or diseases. Tropilaelaps mites could also be confused with the Braula fly (Braula coeca) which is red-brown, 1.5 mm long, covered in spine-like hairs and has six long legs. This pest is currently only present in Tasmania and is generally considered quite harmless. Tropilaelaps could also be confused with Pollen mites (Mellitiphis alvearius) which are light brown and are around 0.75 mm long and 0.75 mm wide. Pollen mites are not harmful to honey bees but are sometimes found in hives. However, if any mites are observed on adult honey bees or in the brood, call the Exotic Plant Pest Hotline immediately on 1800 084 881. Tropilaelaps mites are currently not present in Australia and there are strict quarantine requirements in place to protect the Australian honey bee industry. Surveillance programs, such as the National Bee Pest Surveillance Program are also in place in high risk ports around Australia to detect these pests if they do enter Australia and attempt to eradicate them. If you observe any symptoms that you think may be caused by Tropilaelaps mites, call your local department of agriculture or the exotic plant pest hotline on 1800 084 881. These videos provide information about the life cycle and biology, identification and possible management options for Tropilaelaps mites. Please be aware that some were produced overseas, and treatment recommendations or conditions experienced may differ to those in Australia.